Welcome to Bullseye Shooting, also known as NRA Precision Pistol. 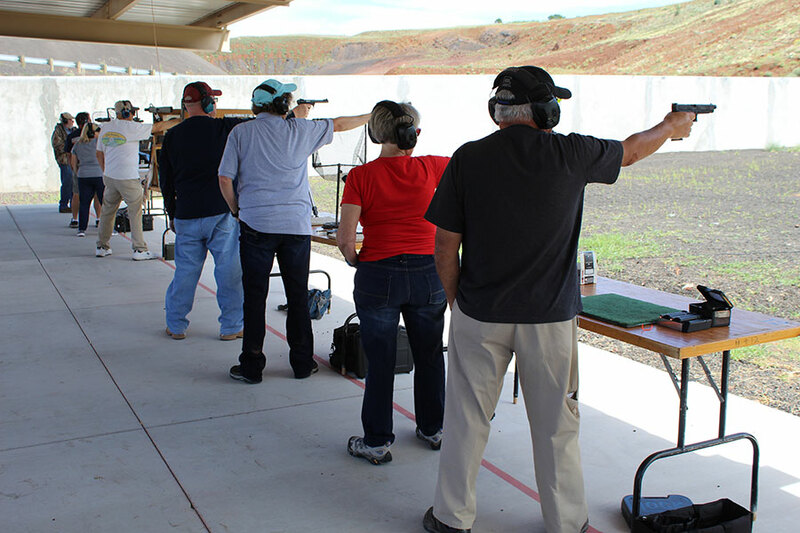 We shoot on Saturdays at 1:30 PM at the 50-yard Pistol Range next to the 100-yard Public Range. Please feel free to come out and join us or just observe this type of shooting. The usual distance for our summer league is 25 yards and 50 feet for the Inland Empire Postal Match (competing against other states) for the winter. For our Saturday league, we generally shoot two 30-shot courses of fire. In a standard Bullseye Match there are three guns, 90 shots per gun. The .22 is first, then any center fire gun, then .45. Standard calibers for the center fire pistol are .32, .38, and .45. For more detailed information on bullseye shooting, visit bullseyepistol.com. See Range Rules for restrictions. The range is located on State Highway 60, 4.5 miles east of the intersection of the 77 and the 60 at the northeast corner of Show Low. The range is located a 1/2 mile off of the 60 at the end of Forest Service Road 206. Coming from both directions, brown Forest Service 2nd Knoll Target Range signs alert that you are approaching the turn onto FR 206. When you see the sign, start slowing immediately as the turn is close. If you are headed east on the 60 and reach Bourdon Ranch Road, you have gone about 1/2 mile too far. If you are headed west toward Show Low on the 60, Bourdon Ranch Road is your landmark that you are close.